Noah, a farmer and family man, is instructed by an angel to build an ark in the middle of a desert in order to save his family and the faithful from a devastating flood – a seemingly impossible task, especially when his sons refuse to believe him and lend their help. Noah risks ridicule from his loving but exasperated family and humiliation from the townsfolk in his quest to carry out his God-given task. But his devoted and loving wife decides to build the ark with him in a show of unconditional support and love. Boasting a stellar cast that includes David Threlfall (Shameless (UK)), Joanne Whalley (The Borgias), Nico Mirallegro (Common) and Ashley Walters (Get Rich or Die Tryin’), Noah’s Ark is a timeless tale, a story of family, one man’s faith, and his fixation with building an ark that may ultimately save both his family and mankind. “Noah’s Ark” is a thought-provoking film, showing what might have logically happened behind the scenes of one of the greatest biblical stories ever told. 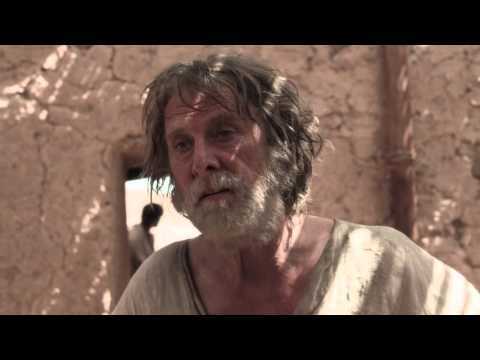 David Threlfall does a wonderful job in playing the Noah of the Bible we have always imagined: a patient and kind man, dedicated, low key, but a determined sort of man. In just one scene, he falls out of character a bit when he is waiting on the rain God warned him would come, and he throws some wood at the ark in frustration. On the other hand, in a humorous scene, Noah says he doesn’t argue with a man unless the man is wrong. In another scene, others come to camp out near the ark before the rain, and a few join the family on the ark, which isn’t exactly what happened in the biblical account, but the film is accurate to a great extent. It certainly features Noah getting the word from God to build the ark. It does include the story of Noah, his wife, and their sons and their wives. The animals also get on board before the great deluge hits them all. The conclusion, with the sign that dry land has returned, is also taken from the biblical text. Some of the family’s experiences are imagined and retold in an artistic way. The film contains some really nice moments. When a man says he believes man is God, Noah hands him a rose and says, “Have him make one of these.” We are pleased to award “Noah’s Ark” our “Faith-Friendly” Seal for ages 12-plus. This story of a man, determined to follow God no matter the comments or cost, is nicely portrayed on the screen.